Reading and share top 43 famous quotes and sayings about Fittest by famous authors and people. Browse top 43 famous quotes and sayings about Fittest by most favorite authors. 1. "And while the law of competition may be sometimes hard for the individual, it is best for the race, because it ensures the survival of the fittest in every department." 2. "When we attempt to clear up the mess others have made, or when we love the unlovely, we demonstrate the kind of weirdness God likes. We give the lie to the evolutionary survival of the fittest maxim..."
3. "The fittest of the fittest shall survive !" 4. "I thought of Sammy Glick rocking in his cradle of hate, malnutrition, prejudice, suspicions, amorality, the anarchy of the poor; I thought of him as a mangy puppy in a dog-eat-dog world. I was modulating my hate for Sammy Glick from the personal to the societal. I no longer even hated Rivington Street but the idea of Rivington Street, all Rivington Streets of all nationalities allowed to pile up in cities like gigantic dung heaps smelling up the world, ambitions growing out of filth and crawling away like worms. I saw Sammy Glick on a battlefield where every soldier was his own cause, his own army and his own flag, and I realized that I had singled him out not because he had been born into the world anymore selfish, ruthless and cruel than anybody else, even though he had become all three, but because in the midst of a war that was selfish, ruthless and cruel Sammy was proving himself the fittest and the fiercest and the fastest." 5. "I fully agree with all that you say on the advantages of H. Spencer's excellent expression of 'the survival of the fittest.' This, however, had not occurred to me till reading your letter. It is, however, a great objection to this term that it cannot be used as a substantive governing a verb; and that this is a real objection I infer from H. Spencer continually using the words, natural selection. (Letter to A. R. Wallace July 1866)"
6. "...it obeys none of the natural laws of hereditary and environmental change, pays no attention to the survival of the fittest, positively sneers at any attempt on the part of man to work out a rational life cycle, is possibly immortal, unquestionably immoral, evidences anabolism but not katabolism, ruts, spawns, and breeds but does not reproduce, lays no eggs, builds no nests, seeks but does not find, wanders but does not rest." 7. "We don't woo our wives with clubs. We don't leave old folks on ice floes. And maybe the time has come to quit diving into rip tides to save people we don't know. We've outgrown a lot of survival-of-the-fittest strategies, and risking our lives for strangers might be one of them." 8. "We live in perilous times and at crossroads. On the one hand, we risk our extinction and that of our planet because of the devastating combination of ancient tribal habits and modern technologies that have the ability to obliterate every living being on the planet several times over. On the other hand, we also possess a nervous system through which the universe is becoming self-aware. More than ever, we have the means and insight to create a brave new world in which our current stage of survival of the fittest can evolve to one of survival of the wisest. The road we choose will determine our future." 9. "The law of the survival of the fittest led inevitably to the survival and predominance of the men who were effective in war and who loved it because they were effective." 10. "The embryological record is almost always abbreviated in accordance with the tendency of nature (to be explained on the principle of survival of the fittest) to attain her needs by the easiest means." 11. "You could be the fittest person imaginable in terms of strength, intelligence, disease resistance and vitality, but if you fail to reproduce your contribution to the future of the human gene pool is zero. For anything to evolve it has to affect the probability of passing on your genes." 12. "All that is really necessary for survival of the fittest, it seems, is an interest in life, good, bad or peculiar." 13. "This survival of the fittest implies multiplication of the fittest. [The phrase 'survival of the fittest' was not originated by Charles Darwin, though he discussed Spencer's 'excellent expression' in a letter to A. R. Wallace (Jul 1866).]" 14. "The fittest person survives! The fighting man succeeds! He who Fights to Fit, will Survive to Succeed!" 15. "Satan's survival-of-the-fittest system appears to work- in the short run. But the great controversy is about the long run." 16. "Knowledge is the consequence of time, and multitude of days are fittest to teach wisdom." 17. "When most of us hear the phrase, 'survival of the fittest,' we assume it originated with Charles Darwin. It did not. The phrase doesn't exist anywhere in Darwin's first edition of 'Origin of the Species.'" 18. "A declining institution often experiences survival of the unfittest." 19. "Boy, there are people who conquered half the world, slaughtered whole populations, wiped cultures off the face of the planet, and you know what history calls them? Heroes! Kings, presidents, champions, explorers. You think America was settled by white men because the Indians invited us her? No, we took this land because we were stronger, and that's how every page of human history is written. It's just our nature. We're a predator species, top of the food chain. Survival of the fittest is written in our blood, it's stenciled on every gene of our DNA. The strong take and the strong make, and the weak are there only to help them do it. End of story." 20. "It felt to me as if we were all involved in some kind of twisted, South-of-the-Border, Darwinian, "Survival of The Fittest" experiment. And I wanted to win." 21. "If I read not amiss, this powerful race will move down upon Mexico, down upon Central and South America, out upon the islands of the sea, over upon Africa and beyond. And can any one doubt that the results of this competition of races will be the 'survival of the fittest?'" 22. "In 2007, my life changed forever. I signed on 'Tashan,' a full-on glamorous masala movie, with two of the hottest and fittest actors around: Akshay Kumar and Saif Ali Khan. And me, rising out of the sea like a Bond girl, wearing nothing but a green bikini. I had nightmares of how my love handles would be on display for the whole world to see." 23. "See, they say it's ‘survival of the fittest', but you and I really know that it's ‘survival of the most heavily armed"
24. "Instead of working for the survival of the fittest, we should be working for the survival of the wittiest - then we can all die laughing." 25. "Evolution is the law of policies: Darwin said it, Socrates endorsed it, Cuvier proved it and established it for all time in his paper on 'The Survival of the Fittest.' These are illustrious names, this is a mighty doctrine: nothing can ever remove it from its firm base, nothing dissolve it, but evolution." 26. "We no longer have natural selection. We have unnatural selection. Survival of the fittest has been replaced by survival of the fakest." 27. "I know it's not good to be weak and helpless. But I don't think it's good to be too strong either. In our society, they talk about survival of the fittest. But we're not animals. We're human." 28. "The year 2100 will see eugenics universally established. In past ages, the law governing the survival of the fittest roughly weeded out the less desirable strains. Then man's new sense of pity began to interfere with the ruthless workings of nature. As a result, we continue to keep alive and to breed the unfit." 29. "Those who were on the inside, the majority that is, for them it had been hard to get his point, mostly they were just pleased that they were on the inside, that they were the fittest.For those on the outside, the fear and abandonment amounts to almost everything; everybody knows that.Understanding is something one does best when one is on the borderline." 30. "Contrary to nature's rule of "survival of the fittest," we humans measure civilization by how we respond to the most vulnerable and the suffering." 31. "The foremost watchman on the peak announces his news. It is the truest word ever spoken, and the phrase will be th fittest, most musical, and the unerring voice of the world for that time." 32. 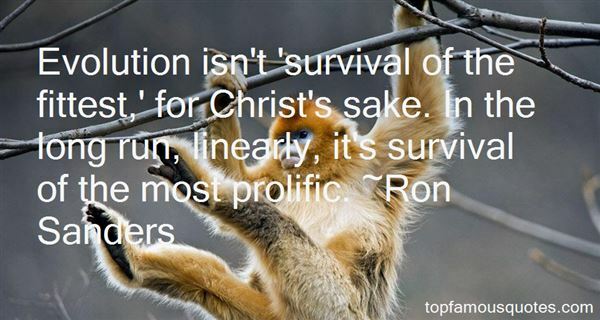 "Evolution isn't 'survival of the fittest,' for Christ's sake. In the long run, linearly, it's survival of the most prolific." 33. 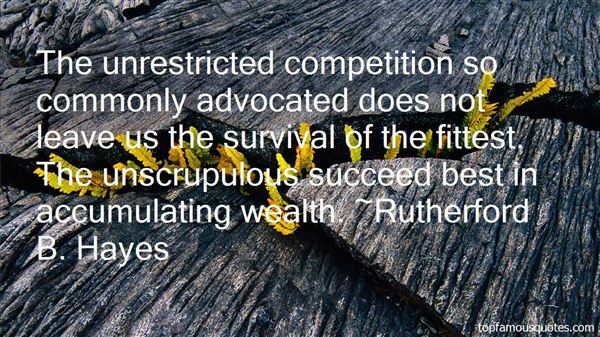 "The unrestricted competition so commonly advocated does not leave us the survival of the fittest. The unscrupulous succeed best in accumulating wealth." 34. "Every one, more or less, loves Power, yet those who most wish for it are seldom the fittest to be trusted with it." 35. "Genetics might be adequate for explaining microevolution, but microevolutionary changes in gene frequency were not seen as able to turn a reptile into a mammal or to convert a fish into an amphibian. Microevolution looks at adaptations that concern the survival of the fittest, not the arrival of the fittest... The origin of species — Darwin's problem — remains unsolved." 36. "It is meant to be survival of the fittest, not survival of the most floral." 37. 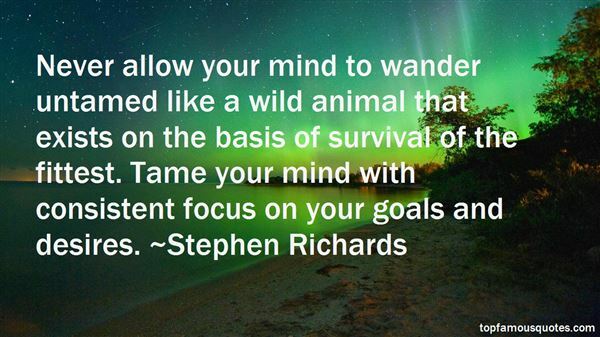 "Never allow your mind to wander untamed like a wild animal that exists on the basis of survival of the fittest. Tame your mind with consistent focus on your goals and desires." 38. "Being quite a Darwinian creature feature I have to add, that only the fittest of survival will finish this book anyway,"
39. "I do care. That's why I hunt them. But if you've seen what I have, then you learn to deal with the murders and disappearances. You learn to push it aside and move on. The other life isn't here anymore. This new world has its own rules. Survival of the fittest is one of them. If you're hoping for kindness and pity, don't hold your breath." 40. "Nature's stern discipline enjoins mutual help at least as often as warfare. The fittest may also be the gentlest." 41. "He [William Jennings Bryan] recognized that what Darwin proposed on the biological level, when applied on the societal level, might legitimize an ideology that supports the survival of the fittest, with all of its dire complications. Byran was able to envision the kind of society that Social Darwinism would create- the kind of exploitation that comes from unbridled capitalism, for instance- and chose to war against it." 42. "Each age has deemed the new-born year the fittest time for festal cheer." 43. "The infinitesimal seedlings became a forest of trees that grew courteously, correcting the distances between themselves as they shaped themselves to the promptings of available light and moisture, tempering the climate and the temperaments of the Scots, as the driest land became moist and the wettest land became dry, seedlings finding a mean between extremes, and the trees constructing a moderate zone for themselves even into what I would have called tundra, until I understood the fact that Aristotle taught, while walking in a botanic garden, that the middle is fittest to discern the extremes. ("Interim")"
You could go out with a camcorder tomorrow and make a movie with virtually no money, but promoting a tiny low-budget movie costs $20 million. And the money they spend on the big movies is astronomical."